When Jesus was getting ready to die on the cross he declared: “It is finished” (John 19:30) Jesus was declaring that He completed the perfect plan of salvation for the world. Here we see the Seventh Angel saying, in a loud voice: “It is done”, declaring the end of times, the end of this dimension of life. Again we see the confirmation of God’s judgment by the hard hearts of the people. With all these signs they still cursed God. Beloved I am totally convinced that just as the Plagues that God sent against Egypt only affected the Egyptians and not the Israelites, this wrath of God’s anger are also designed to only affect the rebellious. This seventh bowl marks the very end of this age; however we are now still in the church age. 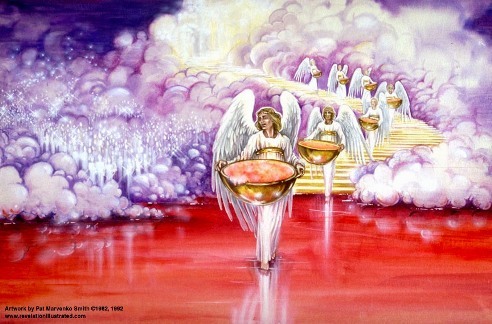 The next event in the prophetic calendar of events is the rapture. From the rapture to the manifestation of God’s wrath is about seven years. Are you Rapture ready?